Home » Regency Queen Elizabeth’s ruff. Detail: Evening dresses October 1796. Regency Queen Elizabeth’s ruff of bread lace 1796. 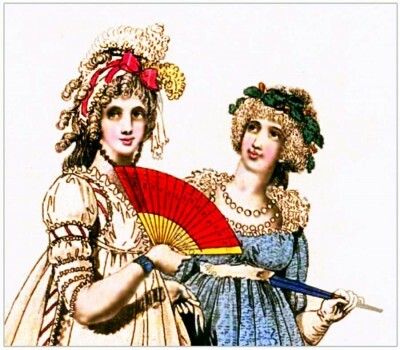 The Gallery of Fashion October 1796. England Evening dresses. The toupee dressed in easy curls; the hind hair turned up plain; the ends returned in ringlets. 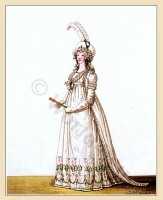 Chiffonet of muslin, with full plating of lace, the ends falling on the left side, crossed with rose-coloured riband, with a bow in the front; one white and one yellow ostrich feather placed very low behind. Petticoat of clear muslin, embroidered in colours, trimmed with broad lace and satin riband. Robe of clear muslin trimmed with lace, and a broad while satin riband crossed with rose-coloured velvet; short sleeves, trimmed in four parts with lace; chemise tucker. A string of pearls fulling from the ear-rings under the chin. White gloves and shoes. The toupee in a light friz, plain chignon, a wreath of oak intermixed in the hair. Round gown of light blue figured muslin; short full sleeves, tied in the middle. Queen Elizabeth’s ruff of bread lace. White satin girdle. Pearl ear-rings. Two strings of beads round the neck. White gloves and shoes. Gallery of Fashion Vol. 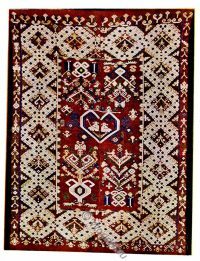 3, 1795-1796. Published by Nicolaus Wilhelm von Heideloff, London. 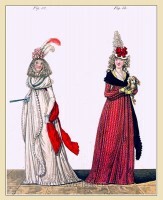 The influence of Marie Antoinette on fashion 1774 to 1780. Les Incroyables et Merveilleuses. 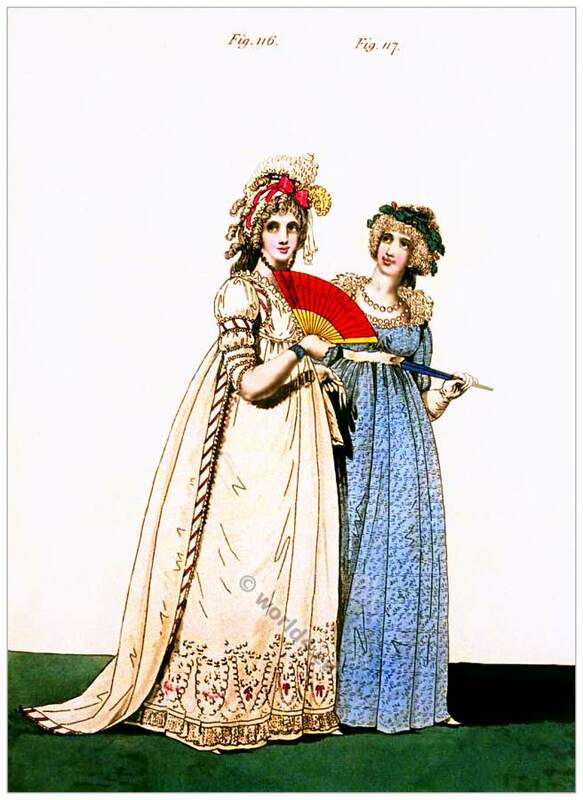 “The Directoire Style” between 1795–1804. 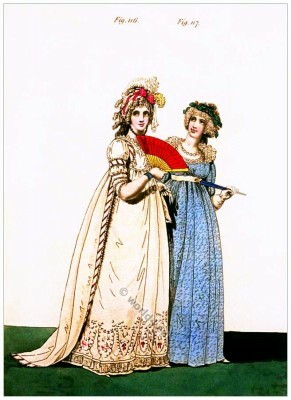 Costume Toque Polonaise. Robe de Velours plein. A Chinese Mandarin. Historical Chinese costume in 1799. A Mohammedan praying. Indian Mughal empire period. Hat à l'Espagnole. Afternoon Dress. Regency fashion 1795. Costume Bateau, Habit Couleur Crotin Culotte de Peau. This entry was posted in 1796, 18th Century, England, Gallery of Fashion, Gallery of Fashion Vol.3, Georgian period, Regency period and tagged England Georgian Era Fashion, Nikolaus von Heideloff, Regency period on 7/25/13 by world4.